It’s been awhile since I have done anything fashion related. Honestly, I’ve never thought my sense of fashion was appealing to others. I kind of just dress however I’m feeling the day I wake up. I like a wide range of things that start at vintage everything to anything dark and creepy. That’s why I don’t particularly classify myself as “goth” or “punk” or whatever else, because people take that stuff way too seriously, and how dare I say I’m something if I’m not living and breathing it 24/7. In a nutshell: I do what I want. Just think of me as your friendly everyday slightly grungy mom with pretty necklaces. However, it’s pretty apparent that I do have a love for weird and odd accessories. I do get asked often where I buy my rings and earrings. I have a love for accessories that can be worn with plain shirts and completely change an outfit. That’s what I’m rockin’ a lot of days. Skinny jeans, a tee, and some odd accessory. Typical disclaimer: everything in this post was purchased by me, and none of these companies know that I am doing this post! Everything is my honest, raw opinion. I tend to buy from individuals rather than large companies. Not all the time, but most of the time, especially lately. I love the idea of my favorite necklaces and hair accessories being handmade. I know that the people I buy from the most put a lot of time and effort into their work, and it shows in the quality of their pieces. So, for today, I want to share some of my favorite pieces that are seen most often in my videos and pictures, and I will include links and mini reviews of each person/company. Worship 13 Jewelry: This is where the two large pendant necklaces and the large Chuck Hodi ring are from. I buy from Worship 13 very often, and I have always had a very positive experience! I most recently purchased a bat and black lipstick phone case from her, and shipping is always pretty quick in terms of independent businesses. She has a huge selection of gorgeous pieces, and is always adding new things. 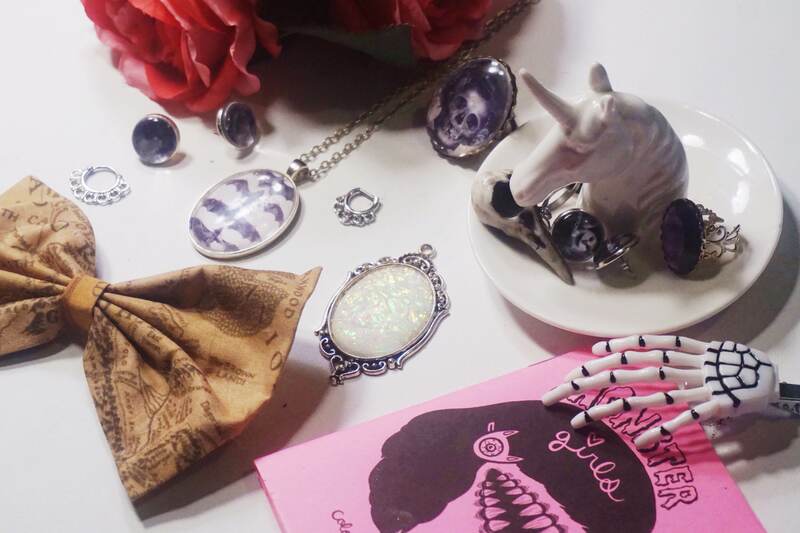 Bella Morta Jewelry: This is where my Deftones and full moon earrings came from. The Deftones earrings were actually a custom order, and I adore them. Any other Deftones fans that follow my blog? She sells some lovely handmade pieces and is always very quick to ship everything. I recently snagged a triple moon coin purse from her off instagram, and a Frankenstein necklace that was featured in my Face of the Day post last week. 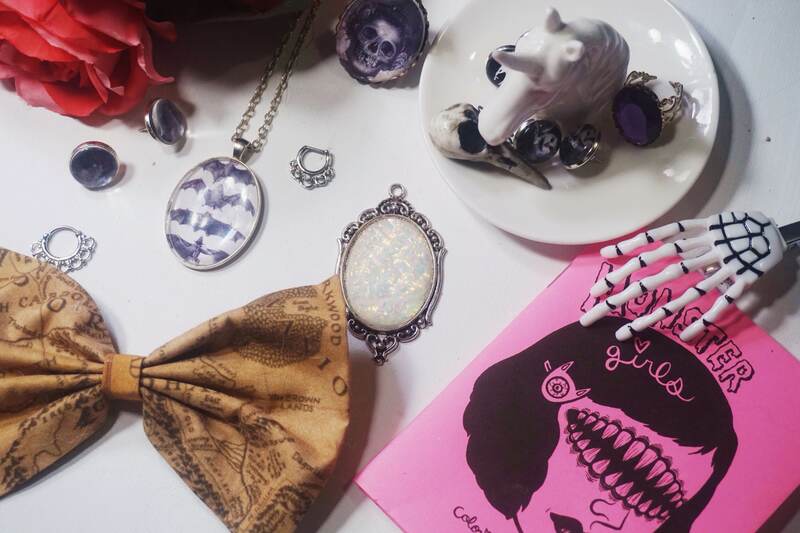 Dulce Calveritas: I discovered this shop through Kat Von D’s instagram page (another angel for promoting smaller shops) and when I saw the raven skull ring my heart skipped a beat and I practically threw my credit card at my computer screen. It’s not a real raven skull, but this ring is very well made. I absolutely love the attention to detail, and almost every time I wear it someone asks me where I got it from. This shop also sells nifty bat bows and coffee bean earrings! Clip a Bow Boutique: Remember when I said I wear whatever I want? Okay, so bows are one of my guilt little pleasures. I think they’re so cute and look great on everyone, no matter the age. I own quite a few, but one of my favorites (okay it’s my favorite) is my LOTR bow. It’s big, it’s nerdy, it’s perfect. 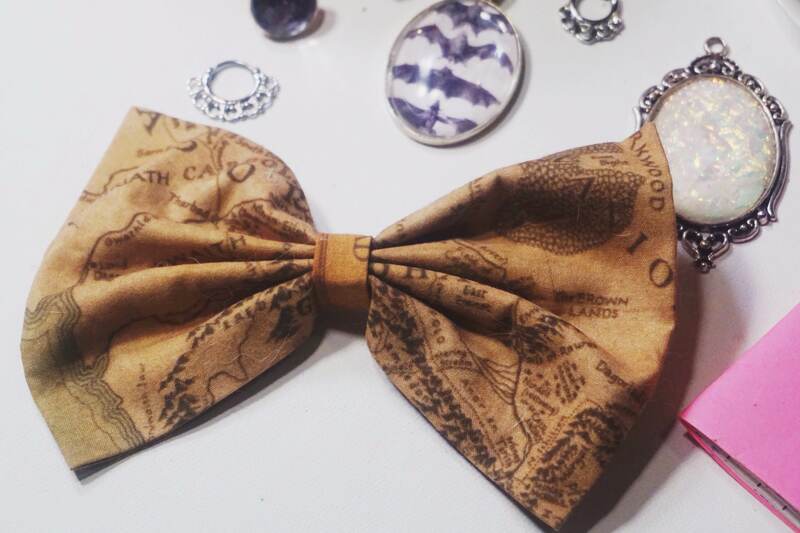 I am a huge LOTR fan, and this bow is a dream come true. Minky Monky Jewelry: this isn’t a small shop, I don’t believe. However, I’ve been getting a few questions about my septum rings and I thought I would mention it. I have been getting most of my septum and nostril pieces from either Minky Monky or Baublenation lately. They sell really lovely pieces at affordable prices. I know someone is gonna read that and judge me for wearing cheaper jewelry, but whatever. Momma is on a budget, and the thought of spending $200 on a septum clicker makes me gag. I don’t wear these 24/7, and I typically change it for my barbell at the end of the day. Dead Spider Hands: if you follow me on Snapchat, you’ve seen this coloring book already. I’m head over heels in love with it. Adult coloring books are very trendy right now, and now I have one that’s perfect for me. 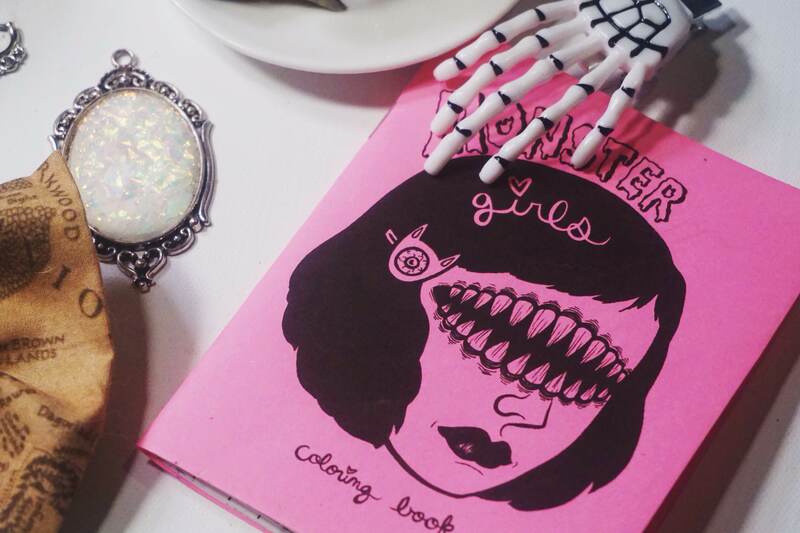 It’s small, it’s cute, and it’s filled with hand drawn monster girls. Coloring is something that calms me down at the end of the night, especially on days where I’m feeling particularly anxious. This entire shop is gold though, and I have a few prints as well. I love buying pieces from independent artists. So, that’s about it for today’s accessory post. These are just a few things that I love! I own a lot of really cool pieces, so if you are interested in seeing more posts like these, let me know! I love sharing new shops that I come across. I hope you’re all having lovely days, and if you want, link me to some of your favorite places to buy accessories and other cute things! I saw your book on Twitter I think? I really want to get one. It definitely sounds like a nice relaxing activity. I haven’t colored in YEARS! Also, that bat necklace is too cool! Great post. I love all your accessories. KVD mentions lots of cool places, doesn’t she?